The FAA is putting out a danger warning, trying to make it a federal crime to point a laser at a plane, saying if this doesn't stop, a mid-air disaster is just a matter of time. While they may look harmless, the FAA says tiny but powerful handheld laser pointers pose a threat to thousands of pilots and passengers in the sky. In a dangerous and growing trend, lasers are typically aimed at aircraft flying at low altitudes -- most often during takeoffs and landings, a flight's most critical times. "It's comparable to a flashbulb being set off in your face at night," Ryan Miller of the Austin (Texas) Police Department Air Operations Unit tells CBS News Congressional Correspondent Nancy Cordes. Miller has been flying helicopters for the department for four-and-a-half years. In that time, he says he's been blinded by a laser beam six times. "We don't have an autopilot, we can't just take our hands off the controls and let the aircraft fly until we're OKK," Miller explains. "We have to maintain control of the aircraft at all times." On Wednesday, a 14-year-old was arrested in Los Angeles, suspected of pointing a small green laser at a jet headed to Los Angeles International Airport. It's just the latest example of this potentially deadly prank. According to the Federal Aviation Administration, the number of laser incidents at airports across the country has risen from just over 1527 in 2009 to more than 2836 last year. Pilot: I just got a guy shooting a green laser at the cockpit here from the ground. Air Traffic Control: Could you tell where it was from? "When it hits the fuselage, the windows are so curved that it acts like a prism and the light becomes overwhelming. It can temporarily blind, or cause damage to a pilot's eyes," says Jim Helps of the Santa Clara Co. Sheriff's Office. 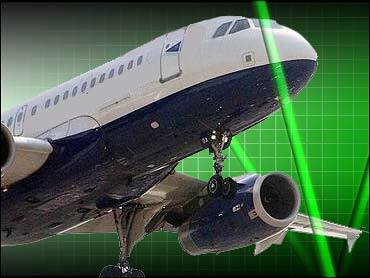 So far, no crashes have been attributed to a laser's interference, but lawmakers and aviation officials are so concerned they're considering legislation to make the act of pointing a laser at an aircraft a federal offense, punishable by up to five years in prison. CBS News Aviation Consultant Mark Rosenker, a former chairman of the National Transportation Safety Board, calls the practice of pointing lasers at planes "a serious and disturbing trend and unfortunately it's growing. The more of these devices that get out there, the more potential for abuse that can happen."